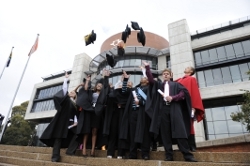 The University of Johannesburg (UJ) has seen a steady growth in its student success rates. The University, which set a goal to progressively improve the graduation rates of undergraduate and postgraduate students, has achieved this with its 2012 output. The University’s overall student success rate grew by 2,2% from 79.2% in 2011 to 81.4% in 2012, making the 2012 achievement the highest since 2008, which had an achievement of 76.6%. The undergraduate student success rate was up by 2.7% from 79.4% in 2011 to 82.1% in 2012. Undergraduate first-time entering students’ success rate improved by 3.5%, from 76.5% in 2011 to 80.0% in 2012, mainly due to better selection of first time entrants and the University’s First Year Experience Programme, introduced in 2010 aimed at easing the school-to-university transition. The total graduates for this year’s first graduation series is 7 825 bringing the total output for 2012 to a pleasing 11 323, resulting in an admirable graduation rate of 23.2%.